Completed around 1880, the Church of England School in Bailey's Cove, now a part of Bonavista, remained in use until the 1940s. The one-room schoolhouse is built on a stone pile foundation and has clapboard siding and a steep gable roof with wooden shingles. It has six-pointed multi-paneled windows and a single gable end door. Side and rear façades after restoration. Bailey's Cove Church of England School's style, design and construction technique are typical of early Anglican schools in Newfoundland and Labrador. After it ceased to function as a school it was purchased by J. T. Swyers Co. Ltd., who used it for storage until it was donated to the Bonavista Recreation Youth Association in the 1990s. The association plans to restore the one-room school and work has been completed on the exterior of the building. Plans are being developed to restore the interior of the structure to represent Newfoundland's first school house, erected in 1727, by the Anglican missionary to Bonavista, Rev. Henry Jones. While the Bailey's Cove school is not the original structure, it is typical of early Anglican schools. The Heritage Foundation designated the school a Registered Heritage Structure in May 1997. 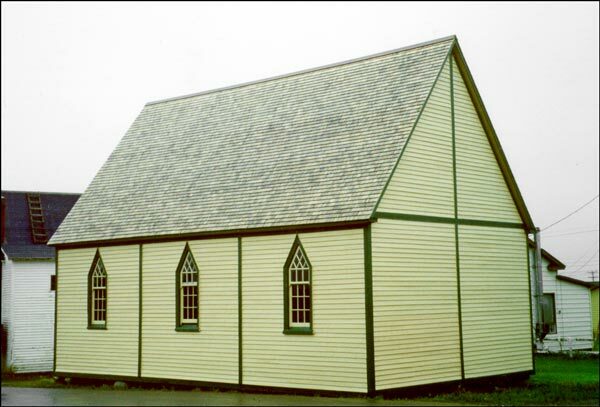 Also view the Bailey's Cove Church of England School Registered Heritage Structure, and the Bailey's Cove Church of England School Municipal Heritage Site on the Heritage Foundation of Newfoundland and Labrador web site. The Newfoundland and Labrador Heritage Web Site has on its site only a portion of the registered heritage structures in Newfoundland and Labrador. To view a complete list or search for a particular structure visit the Heritage Foundation's Property Search page.